The Pololu universal aluminum mounting hub allows you to mount custom wheels and mechanisms to 5 mm motor shafts. The hubs are sold in pairs. 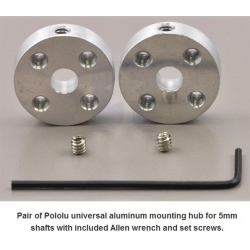 The set includes one Allen key and two 4-40 set screws for securing the hubs to motor shafts. Each hub has four mounting holes for 4-40 screws (not included) letting you mount custom wheels or mechanisms to your motors.